Najnagrađivaniji srpski film u 2012! 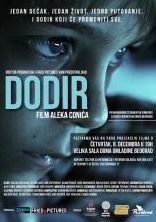 The most-awarded Serbian movie in 2012! pre projekcije filma "Smrt čoveka na Balkanu"
A lonely composer commits suicide in front of his computer web camera. The whole “big” event, as one of the neighbors calls death of his neighbor, starts when Aca enters the deceased apartment after he heard the gun shot. He reveals the dead neighbor lying on the floor and became “the first witness”. Therefore, he stays in the apartment to wait for the police but, as the time goes by, many other neighbors start to interfere. Whole time recorded by a webcam, which they are not aware of. While waiting and to shorten the time, they drink, eat and play chess. Evoke memories of him, pity him, praise his music even though they can not remember his name. Since the traffic jam prolongs police arrival, they witness many unusual “comers” including the undertaker, the real estate agent along with the apartment buyer, pizza delivery guy and medical officials. In the thrilling and effective dialogue they welcome police and forensic officers who reveal the fact of working web camera. From that moment until the end of the “small gathering” the situation and relations between surprised randomly assembled group became different under the pressure of camera and need to justify previous statements and actions as well as a broader, satirical picture of our society. « Atina, Grčka, 26. Novembar 2012. « Leskovac, Srbija, 25. Septembar 2012. « Zadar, Hrvatska, 31. Avgust 2012. « Niš, Srbija, 30. Avgust 2012. « Tuzla, Bosna i Hercegovina, 26. Avgust 2012. « Vrnjačka Banja, Srbija, 18. Avgust 2012. « Hercegfest, Herceg Novi, Crna Gora, 07. Avgust 2012. « Karlovy Vary, Czech Republic, 07. Jul 2012. « Sofest, Sopot, Srbija, 06. Jul 2012. « Cinema City, Novi Sad, Srbija, 23. Jun 2012. « Athens, Greece, 26. Novembar 2012. « Leskovac, Serbia, 25. September 2012. « Zadar, Croatia, 31. August 2012. « Nis, Serbia, 30. August 2012. « Tuzla, Bosnia i Herzegovina, 26. August 2012. « Vrnjacka Banja, Serbia, 18. August 2012. « Herceg Novi, Montenegro, 07. August 2012. « Cinema City, Novi Sad, Serbia, 23. June 2012. JEDAN DEČAK. JEDAN ŽIVOT. JEDNO PUTOVANJE. I DODIR KOJI ĆE PROMENITI SVE. Film Dodir koji je snimljen u produkciji kompanije Doktor Fried, dobitnik je nagrade za scenario na konkursu grada Beograda za kratki igrani film. Scenarista i reditelj Alek Conić je diplomirao na kanadskoj akademiji za film u Torontu. Njegov prvi kratki film ”Dead End”, dobitnik je nagrade za najbolji film i najbolju režiju na Studentskom filmskom festivalu u Torontu (Toronto Student Film Festival) 2005. godine. Nakon višegodišnjeg rada u Kanadi i Americi gde njegova ostvarenja dobijaju međunarodna priznanja, trenutno radi u Srbiji gde je angažovan na filmu i televiziji.